1. 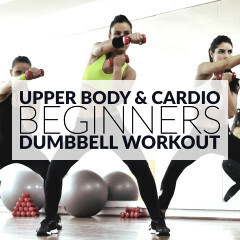 Grab a set of dumbbells, bend your torso forward and keep your knees slightly bent. 2. 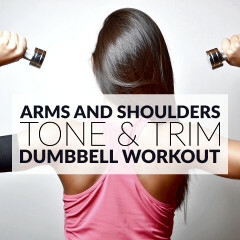 Pull the dumbbells toward your waistline, while squeezing your shoulder blades. 3. Slowly lower the weights to the starting position. A 1-second pull, 1-second pause, 2 second down count is ideal. While doing the dumbbell bent over row, pull the shoulders back, keep your head up and facing forward and maintain your back straight. Exhale as you pull the dumbbells toward the waist and keep the elbows close to your body during the entire movement. Adding the dumbbell bent over row to your workout routine helps to sculpt your back, shoulders, biceps, and forearms. This exercise also strengthens your core and helps to tone and tighten your entire body. The back muscles are stronger than the muscles in your arms so you should choose a heavier set of dumbbells to properly work those muscles. Do 3 sets of 12 to 16 repetitions and start with one arm at a time to acquire proper exercise form.